For those who don't know, Compass Box buys casks of whisky from other distilleries, blends them in precise ratios, ages them further in different casks (different cask sizes, char levels, different wood types etc.) and blends them again to create a unique flavour profile. They never use E150A (caramel colouring) and they never chill-filter their whiskies. They also provide infographics on their website so you know almost everything about what's in your bottle. They don't disclose the age of the various components because the Scotch Whisky Regulations only permit the disclosure of the youngest component whisky. Allegedly. It's kind of complicated. Compass Box isn't perfect, but you'd be hard-pressed to find a company that discloses more information to their consumers. I've even heard that if you email them, they'll disclose the age of every cask that went into your bottle. They'll kindly ask you to keep that information to yourself, though. So what's in Oak Cross? According to the fact sheet, its volume is malt whisky from Clynelish (60% of total volume), malt whisky from Dailuaine (20% of total volume) and malt whisky from Teaninich (20% of total volume). How does it taste? Nose (undiluted): very floral at first (honeysuckle? ), vanilla, nutmeg, cloves, citrus. Finish: Oak tannins, more vanilla, waxy - almost like melted candle, but in a pleasant way, a hint of ginger, cayenne pepper. I contacted Compass Box for more information on my bottle of whisky, and they answered all my questions. I won't re-post their answers here, per their request, but they were more open and accomodating than any other whisky company with whom I've communicated. They also answered my questions in less than 24 hours. I'm very impressed with this company. Oak Cross Blended Malt is good, but like my 1989 Montreal Canadiens, it isn't championship level. Would I buy this again? Absolutely. The price is very reasonable and the whisky is pleasant, refreshing and original if somewhat one-dimensional. It's almost all vanilla and oak spices, albeit pleasant ones. Your mileage may vary. I've had people tell me there was a note reminiscent of "baby throw-up" in here. I didn't taste that at all, but you may want to try before you buy. Compass Box Oak Cross Got wood? @OdysseusUnbound, you always tease us on the blog content, dontcha? @MadSingleMalt My mother insisted there was a baby-sick note in there that dissipated quickly. I didn't get that at all. I think the originality comes from the hybrid barrels. And from disclosing the ages to the inquiring customer. Also, I've never experienced that melted birthday candle note before. It was different, and pleasant. @MadSingleMalt Also, I'm always trying to boost blog traffic. It varies wildly. Some weeks I get over 300 views, other weeks I barely hit 150 views. Not that I make money from the blog. It's basically an ego massage. A sorry excuse for an ego massage. @OdysseusUnbound, I laughed to myself as I opened up this review, because I had been saying to myself, "He's going to rate this 82!..." ..."...because it isn't peaty." Baby puke in Oak Cross? I don't notice it. Thank God. But then I didn't notice it in Dalwhinnie 15 either, which is more famous for it, according to those who partake of that experience. As blended malts go, this is a really good one. I haven't yet met anyone who disliked it. Most really appreciate it. More than 82 points worth. But it gets a "D" grade on peatiness. My bet, @OdysseusUnbound, is this: the longer you have this bottle and the more experience you get of it, the more you will appreciate it yourself. This is mild-mannered malt whisky, basic Scotch. Many "Scotch lovers" don't like basic Scottish malt whisky. @OdysseusUnbound, so would you say the originality is to be found the whisky itself—meaning, would it seem original if you were drinking in blind? Or is the originality all in the information about the whisky? @Victor The lack of peat isn’t really what knocked the mark down. And I wouldn’t call 82 a “D” grade. We’ve discussed my difficulties with grading before. I’m a teacher, so anything 80 and above is solidly in “would buy again” territory for me. I agree that it’s mild-mannered, but it’s the sort of “lack of range” (if that makes sense) that prevents it from scoring higher. There are no real highs and lows; it’s all midrange for me. I feel Dalwhinnie 15 is a better example mild, yet well-executed style of scotch. Going strictly from memory, I’d probably rate Dalwhinnie 15 in the 86-88 range. This shouldn’t suggest I didn’t like this whisky. Let’s say I’m more impressed with Compass Box’s business/customer service approach than I am with this whisky. I will definitely buy more of their products in the future. "D" on the peatiness scale, not overall. 82 is not a bad grade for a whisky, in general. I am just saying that within its genre Oak Cross is a very good one. Give your bottle time. I expect that it will develop. Don't be surprised if you find it creeping upwards in your affections. That was my experience. This is not 'wow' whisky. This is mellow whisky. In this case, I found your "original" point in this tidbit: "The price is very reasonable and the whisky is pleasant, refreshing and original if somewhat one-dimensional." @MadSingleMalt Sorry, I missed that. I’m on my mobile, no CTRL button. But I’ll stick with the “melted candle” aspect of it being “original”. I’m told that’s a contribution from Clynelish. I wouldn’t know as I’ve never had a Clynelish single malt. @OdysseusUnbound, roger that. I remember having my mind blown a couple months ago when I learned that the famous "wax" that people are always citing in Clynelish was a quality of its taste, not its texture. Sounds like you're tasting it too. @SKEPTIC, is that reference to my "mind blown" comment? Is there any purpose—or indeed, basis—to your insults? What's your problem? Any chance you'll answer me here? Or should I expect crickets again, like every other time I've challenged you and your stupid antagonism? @MadSingleMalt Candle wax. What were you thinking? @OdysseusUnbound You should try and get a taste of Clynelish 14. That would clear up any questions about where the waxiness comes from. Thanks for the review - not had a bad Compass Box it must be said. I'll also add that Bluenote is correct re the Clynelish and waxy notes (in my exp). Glencadam 10 had a similar note but erred more towards play Doh! @RianC As blended malts go, I put Oak Cross up there with JW Green as a favourite. Haven't had it for a while, must get one for the cabinet. @BlueNote If only I could find some. Ontario’s selection isn’t great. I feel like this whisky would be better with some more aged stock; it’s not “green” by any means, but there isn’t a ton of depth of character, which isn’t that surprising given that the majority of the mix is about 6 Years Old. Side note: while I only posted the full blog post yesterday, my review of Oak Cross is my least viewed post ever. I average about 80-100 views in the first 24 hours: this review is currently sitting at about 25. Not that it really matters. @MadSingleMalt I was a bit late with it. But it’s quite petty of me to seek out this kind of external validation. Oh well, find me a blogger who isn’t vain and I’ll call them a liar. Made a liquor run a few days ago and really thought long and hard about picking up a bottle of Oak Cross, which I reeeaaalllllyyyy like. For the last couple of years I've been preferring bourbon cask whiskies more and more, and not so much the peaty or sherried ones. (Also been drinking a lot more of bourbon.) This is lovely stuff that I can drink anytime, kinda like Glenmorangie Classic, and it's cheap ($42). Next run I will definitely pick one up. BTW, I picked up Evan Williams BIB ($11), Pikesville Rye ($37) and Glenrothes Vintage Reserve ($45). With tax, that was a C-note and pocket change. I'm looking more at finding value whiskies that are very good. On the last trip at another (higher priced) store, I got Glenmorangie Classic with two samples of Quinta Rubin and La Santa ($35), ECBP ($47) and WT 101 ($22). Still only $113 with tax. All good to very good whiskies at great prices. @Taco Is that Elijah Craig Barrel Proof for $47??? What sorcery is this??? I get what you’re saying about value; I’m overjoyed to find I like Wild Turkey 101 as much as I do. It’s inexpensive, by Ontario standards, at $36 CAD. 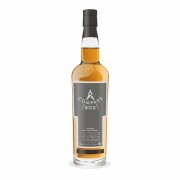 Lot No.40, even the non-Cask Strength version is regularly found for $35 which is a great deal. I may have to try the Evan Williams BiB as I keep hearing good things about it. @OdysseusUnbound ECBP is only $150 in Ontario... when it's available. My two bottles weren't that inexpensive, I paid about $60-70 US each. For that power.... a heck of a good deal. That's the highest I've paid for ECBP. It was $28 about 18 months ago, but is getting too popular, like Booker's, which is now $70. The EW BIB is a fantastic buy. Let it sit in the glass for a while and it smooths out and is about as good as WT 101 (and I love WT!). Usually I add a bit of ice and let it melt, swirl it and enjoy! Appears I have a soft spot for a 75-13-12 mash bill. @Taco, at $ 28, or even $ 45 for ECBP you better not tell anybody where you are buying it.